The Frederick bedsore injury attorneys of Nursing Home Law Center LLC believe in promoting real change to the nursing care industry by holding facilities accountable for their egregious and horrendous disregard for the rights and wellbeing of the people they promise to serve. There is little reasonable excuse for why any patient should be allowed to suffer in silence from advanced pressure ulcers without any intervention from their caregivers. We see the failure of nursing homes to prevent these injuries as a sign of systemic neglect that stems from the understaffing of facilities in an effort to reduce overhead and boost profit at the expense of the people served. Frederick is the second largest city in Maryland with a population that is nearing 70,000 people. About 11% of its population is over the age of 65 and there are a large number of residents who will enter the senior population over the next ten years. This will result in a very strong demand for quality senior services and programs that are tailored to helping residents remain active and independent well into their golden years. The Frederick Senior Center allows aging residents to connect with likeminded peers, participate in exercise classes, enjoy hot and nutritious meals, play games such as Bridge or Mah Jongg and take up hobbies such as knitting, arts or crafts. Only one of Frederick’s thirteen nursing facilities received a five star rating from Medicare, while nine received three stars or fewer. For many people who are facing the decision to place a loved one into a nursing home, this can be a reason for them to delay the process, often at the detriment of the people they care about. Our Frederick pressure sore lawyers refer many people to the nursing home compare tool at https://www.medicare.gov/nursinghomecompare because it allows them to expand their search outside of the immediate area to find more viable options. By expanding your search to only 50 miles, you immediately are presented with 44 five star options and the ability to compare homes side by side based on distance, accepted forms of payment, facility type and more. You can also see how well each home is staffed, whether a facility has failed recent health inspections and if the center you are considering has been fined in recent history due to negligence or noncompliance with health standards. 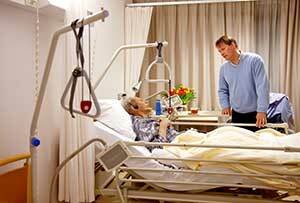 As for profit nursing homes continue to permeate the market, we have seen a sharp rise in the number of reported bedsores. This is due to the unacceptable practice of understaffing in order to save money on wages. When nursing homes do not have enough staff members, patients are not given the same level of attention and may even be neglected for long periods of time. Pressure ulcers form when patients are not moved for extended periods of time and it takes weeks for these sores to become open and festering wounds. It is incredulous to believe that any attentive caregiver would fail to notice a patient in pain, which is why it is obvious that these injuries are most commonly linked to severe underemployment. Nursing Home Law Center LLC is a leading advocate for those who have been neglected or abused while under the care of a nursing facility. If your loved one has a severe pressure ulcer, this is likely a sign of neglect over an extended period of time and you may be entitled to recover compensation. We would like to hear your story and determine whether we can help hold your loved one’s nursing home accountable for its misdeeds, so contact us today to arrange a free consultation with one of our award winning Frederick bedsore injury attorneys.